This August, we're devoting our Magpie of the Month posts to a woman who celebrates her birthday in a few weeks: Anne-Marie, the Danish princess who was Queen of Greece in her youth. 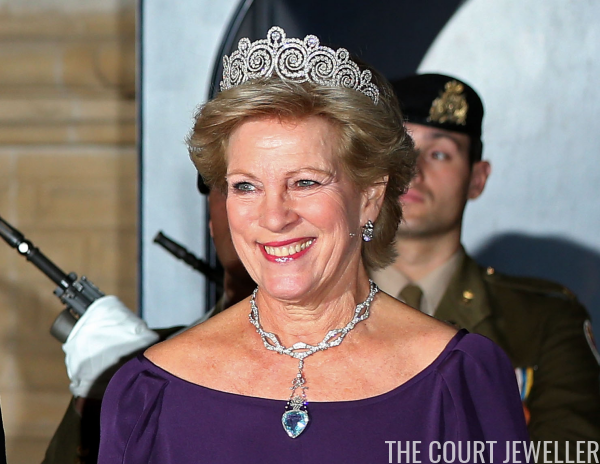 We're kicking things off with a piece that connects her with her Danish royal heritage: her diamond necklace, made from a sautoir that belonged to Queen Alexandrine. 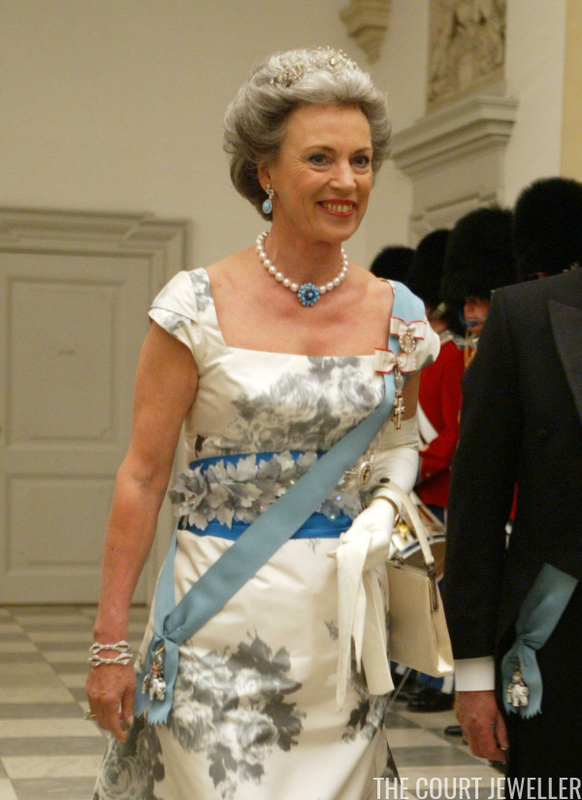 Anne-Marie and her sister, Princess Benedikte, own identical diamond necklaces. The pieces were made by dividing up a sautoir -- a fashionable long necklace worn in the 1920s and 1930s -- that belonged to their Danish grandmother, Queen Alexandrine. The original necklace was always able to be taken apart and worn in different lengths and configurations, so dividing the piece for the young princesses was not a difficult task. 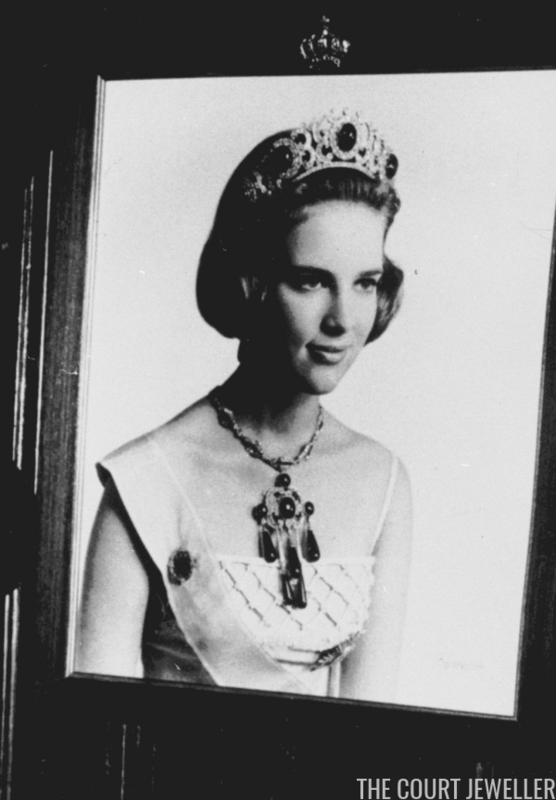 Both women began wearing their necklaces in their youth; above, Anne-Marie wears hers a few days after her eighteenth birthday, shortly before she married King Constantine II of the Hellenes. Anne-Marie brought the diamond necklace with her to Athens and used it immediately, often combining it with various pendants, including a substantial cross. 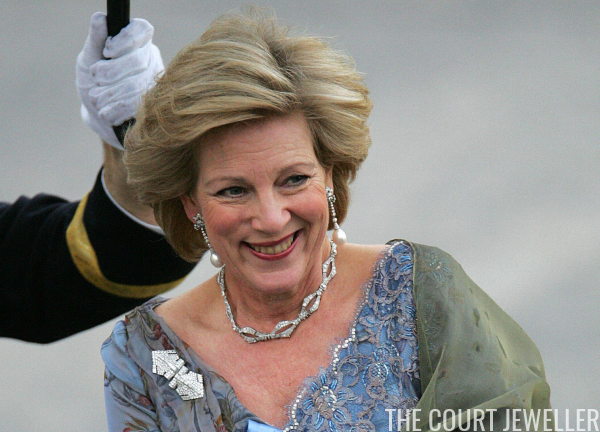 In the portrait above, she uses the large brooch from the Greek royal family's emerald parure as a pendant on the necklace. The necklace followed her into exile, and she's continued wearing it ever since. 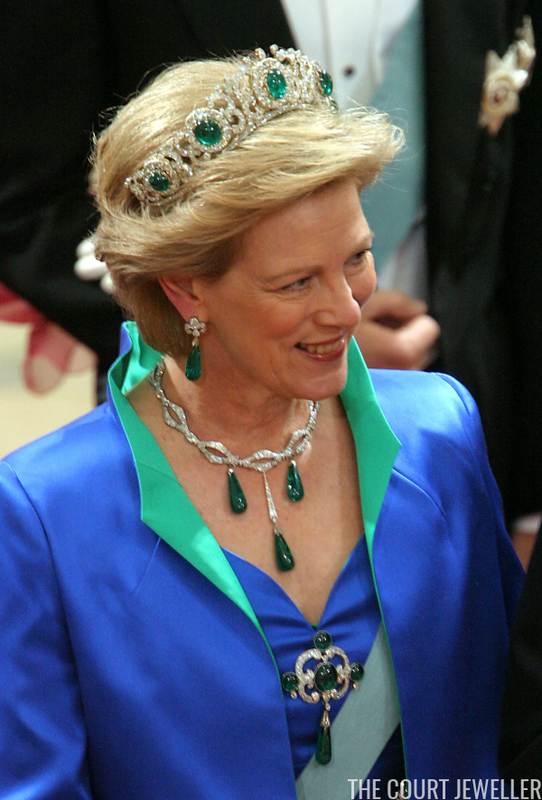 Here she wears it with a different configuration of the Greek emeralds for the wedding of her nephew, Crown Prince Frederik of Denmark, in 2004. The necklace's simple design and its all-diamond setting allow it to be combined with numerous gemstones. In Luxembourg in 2012, Anne-Marie wore the necklace with a heart-shaped aquamarine pendant that had belonged to her British-born grandmother, Princess Margaret of Connaught. Her tiara on the occasion, the magnificent Khedive of Egypt Tiara, also belonged to Margaret. 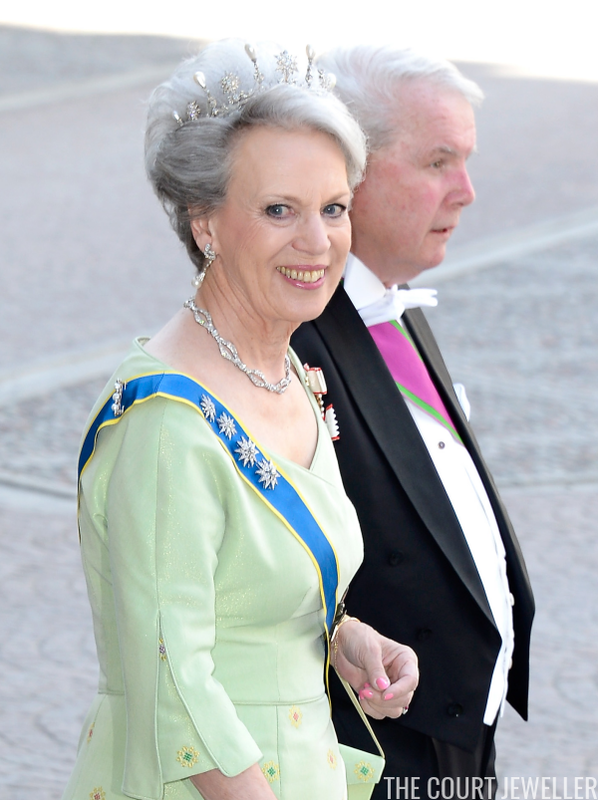 For the sake of comparison, here's a look at Princess Benedikte wearing her identical diamond necklace at the wedding of Princess Madeleine of Sweden in 2013. 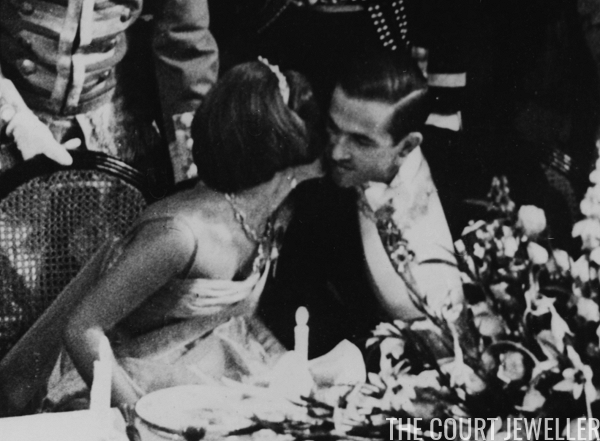 (More on the Star and Pearl Tiara she wore with it can be found here!) Benedikte also often wears her necklace with various pendants from her jewelry box. Even after being split into two, the necklaces are still able to be worn in different configurations. An example of their continued versatility can be seen here, as Benedikte wears hers divided as a pair of bracelets for a pre-wedding gala in Denmark in 2004.